Tourist-Channel Slovakia - Haluzice Tourist-Channel Slovakia: New homepage! 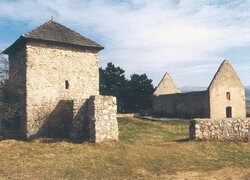 In the Bošácka valley in the northwest of Nové Mesto nad Váhom is situated village Haluzice known thanks to its antigue ruins of a fortified church. The first written mention of village is from the year 1398 under the name Halusych, the first written mention of the Church is from the 13th century, (1477 Halhozycz, 1598 Haluzics, 1773 Haluzicze). The Hungarian name of village was Gallyas. Village is situated on the border of the White Carpathians, absolute altitude, number of inhabitants 80. 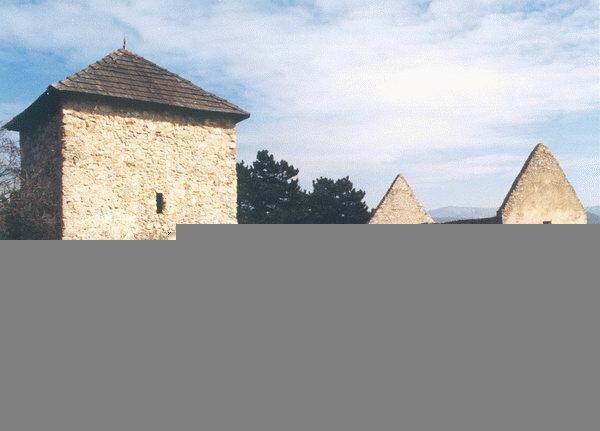 The first written mention of the fortified Church is from the year 1299 in a document where is described a situation of obtaining the Haluzice´s Castle by the royal army from Matúš Čák. It was during the reign of the last Hungarian King Ondrej III from the Arpád´s family. There was a conflict between Matúš and the King. Because on the right bank of the Váh river there was neither castle nor hill-fort, the Church was fortified as a short-term refuge from the surroundings during the wars. Round the Church there was built a protective stone wall with many towers and loopholes. Ruins of the Church were restored in the year 1968 and you can see them from the Považie.